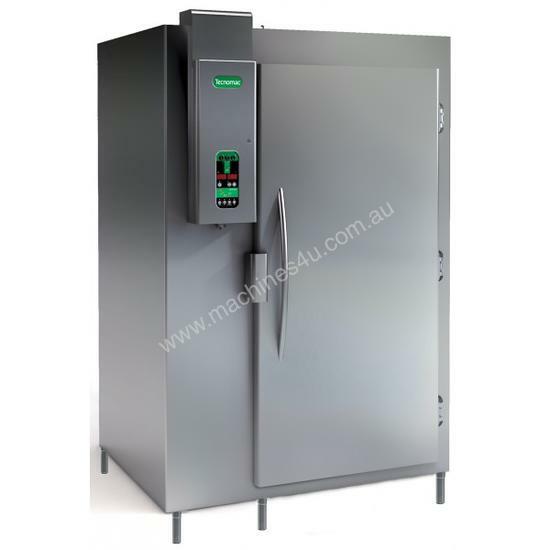 Remote blast chiller/freezer - Rational trolley castors stay outside machine, To suit the CURRENT Rational SCC202 trolley, 200 kg Blast Chilling +95°c to +3°c, 175 kg Blast Freezing +95°c to -18°c, REMOTE CONDENSING UNIT INCLUDED IN PRICE to suit remote run up to 25 metres. AISI 304 stainless steel interior and exterior, R/H hinged door, HACCP memory included, Automatic preservation at the end of cycle, Indirect air flow, 99 programs, Trays and trolleys not included, Painted evaporator with easy access for cleaning and service, Semi-hermetic condensing unit, Conic core probe for easy extraction, Hot gas - very fast and efficient defrost, Comes assembled - except the door. POSITIONING, ASSEMBLY, INSTALLATION PIPEWORK & CONNECTOR CABLE, REFRIGERANT GAS, AND CONNECTIONS BY REFRIGERATION MECHANIC & ELECTRICIAN ARE NOT INCLUDED. OPTIONS: - UV sterilisation - HACCP printer - HACCP USB Pen Drive - Water cooled condensor.